Employees and contractors receive on-the-job training and skills development. At Canadian Natural we know that people are the foundation of our business; we develop people and ensure we have the right people with the right skills. Developing people strengthens our culture and drives us towards our goal of execution excellence. In addition to the skills and expertise that employees and contractors have when they are hired by Canadian Natural, they receive on-the-job training. Training can be online and classroom-based, and includes required safety and competency courses, as well as ongoing professional development opportunities. Competency training outlines safety training requirements for specific roles and helps make sure all workers are competent to complete assigned tasks safely and effectively, with minimal or no supervision. To ensure the safety of individuals and those around them on worksites, we track every employee’s competency and skills training for each operating division. In our North American operations, we are implementing a centralized Learning Management System (LMS) to provide a single point of access for all training and to manage records in a consistent way. The LMS tracks any type of training or professional development required, including safety, competency, or continued professional development credits/hours required to maintain professional designations. This system centralizes classroom course registration, computer-based training, and report generation for compliance and competency measurement. The LMS is also able to use materials that comply with the Sharable Content Object Reference Model (SCORM) and third party training. SCORM is a set of technical standards for e-learning software products used by industry. All results are automatically captured within the LMS to provide standardized certificates of completion. Similarly, at our United Kingdom (UK) operations we use a Competence Management and Development System (CMDS). For off-site training, we source a variety of training providers and follow a training matrix which looks at all the training requirements of the various supervisory roles offshore. Read our 2017 Stewardship Report to Stakeholders for more information on our investments in competency training. 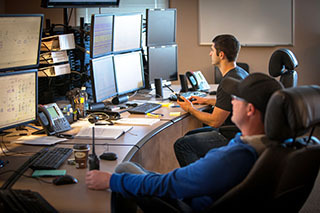 Control room at Kirby South operations in Alberta.